Y U M , Y U M ! W H A T W A S T H A T ? Enough with the barking dogs and mediocre morning radio, put together a feel-good playlist (or update the one you already have) to ensure those vital first few minutes of the day are filled with good vibes - release that dopamine! M M M , T H A T F E E L S G O O D . . .
W H O I S T H E F A I R E S T O F T H E M A L L ? That's right, and you're also not in that same old chair you move towards every morning. Break with tradition and look for a prettier part of your surroundings in which to enjoy breakfast. Perhaps a seat with a view of your surrounding cityscape, or lush garden. Maybe up on a window seat, nestled into a plush armchair, or on that pretty decorative chair you've pushed to the corner of the room. Or perhaps even back in bed with a magazine for company! Out with the old, in with the new! I'm certainly embracing adding a healthy dose of 'glamour' to my morning routine, and as always I'd love to hear your thoughts on the topic. Do you have any plans to upgrade your morning routine? Let me know in the comments below! Liked this post? You might also enjoy >> How To Be A Glow Getter This Spring! Thanks to Bonsoir of London for working with me on this post! Even if I tried all of your tips, I just don't think my mornings would look as glamorous and effortless as yours! I loved reading this post! I think a great morning routine is a good way to make you feel more productive too. Definitely setting the tone for the day, as you mentioned. And please tell us where that divine glass bowl is from? I don't think I've ever seen one like that before with a gold rim! Okay that robe is lovely! My morning routine is never this nice, or nice at all for that matter. I've got to take your advice. I'll try better in the morning lol! I don't really care about mornings other than coffee and a very good breakfast. 4 years living here in Canada and I still love a good, big, hearty Malaysian breakfast. Your dress is stunnnnnning! Just loving' the print!!! WOWOWOWOWO!!! I so want to try everything you have mentioned. It is very important to start your day right. These are such fab photos! I love to listen to music first thing in the morning, it really helps me start the day the right way. A healthy breakfast is a must for me, I can't think on an empty stomach. Finding a beautiful spot to enjoy our breakfast or a cup of coffee can really improve our mood. A morning routine can be so important in this time and age. It can give us that lux feeling. Taking a few minutes to relay in the morning is one of the best things we can do. If we start our morning in a good way, it can help us to keep a positive frame of mine throughout the day. Beautiful photography. You always look gorgeous. Gorgeous images as always. And the perfect sentiment, we could all use more glamorous mornings. I love that robe, beautiful on you! :) I usually try get up before the boys in the morning and have a little quiet time to myself before the craziness begins, haha! I do feel more organised if I get some time to be productive before it's cleaning up messes and getting boys fed and dressed to get out the door on time! If only my mornings looked like this! Haha! I always get up around 6:30am or 7am. I then have my morning coffee and enjoy some me time by the balcony, then I do what I have to do that day, after taking a bath (which I enjoy so much) and throw in one of those dresses to be around home. One thing I for sure do and follow very religiously to have a good start of the day, is sleeping between 8-10 hours per night, sometimes 12 but that's not so often, that will make my morning much better, easier and very productive. I also love your robe! Thanks for sharing this post and tips! Hope you have a lovely mid-week! Such great tips gabrielle and that gown is stunning on you!!!!!! This is such a nice read dear, I'll definitely take note of your tips. Also, your dress is so lovely on you dear. How nice has this weather been? Excusing this week, although I did enjoy the thunderstorms, the drizzly morning commute not so much. You've shared some amazing tips for making the morning's easier. If I could eat my breakfast outside in the garden everyday I would, and I agree with using the skincare products and not just letting them get forgotten about. I love your photo's too. This is such a gorgeous look - absolutely beautiful post and loving all your photos as usual! Completely agree about breakfast bowls - I always change up the kitchen accessories as I think that just makes such a difference to presentation and overall, the way you feel! Love that and the glass bowl with the touch of gold is stunning! The dressing gown looks gorgeous! And I absolutely love the glass bowl. I want one for myself now. I don´t do breakfast and most of my morning is spend wrestling the kids into their clothes. I will bookmark the page and come back in, well, ten years time? Wow your bowl is so pretty! I want to have my breakfast on one of those too haha. :D Mornings are always hard for me, but the skincare part is always my favorite! Those bowls look so lovely! I am such a bear in the morning that I need to try some of these asap! These are such glamorous ideas. I'll definitely apply some to my morning routine! Quality morning routines are sooo hard to achieve! Ugh, especially for us bloggers that have another full-time job! Howeveer, I do love reading posts like this! It keeps me reminded that we all need to treat ourselves right and give ourselves a proper break and enjoy life! You look gorgeous babe, and I love this dress on you ! I love your dressing gown! I've actually been looking for one for a while and finally scooped up a pretty floral one that I've really been enjoying. I also totally agree about using your nice skincare and makeup products (if you're applying makeup). There's no point in saving the best for special occasions that never come around because you'll just never end up using your expensive products, when the whole point of having them is to use them. I need to remember these tips. I am pretty happy with how my morning routine is right now but there are always room for improvements! I love this! All those little details make just as much of a difference in your morning as setting goals and checking off your to do list. It's so funny because I am SO much more amped to eat my healthy breakfast when it's out of one of our cute clean white bowls. I'm honestly considering switching the whole set just because of that! Not nearly as baller as your bowls though... :). And using good skincare in the morning makes me feel like I've got my ish together. I'm in love with the Watermelon Glow products. They smell SO yummy! And Ben read that your sub-conscious is the most receptive first thing in the morning, so listening to happy music of motivational speeches is a go to! Hope you are having a lovely Thursday! That robe is so elegant. I've been looking for one of these to make my loungewear more chic! Having a good morning routine is so important! Pretty bowls and places (and mugs, I love mugs!) do make such a difference - everything is better when it's fancy haha. 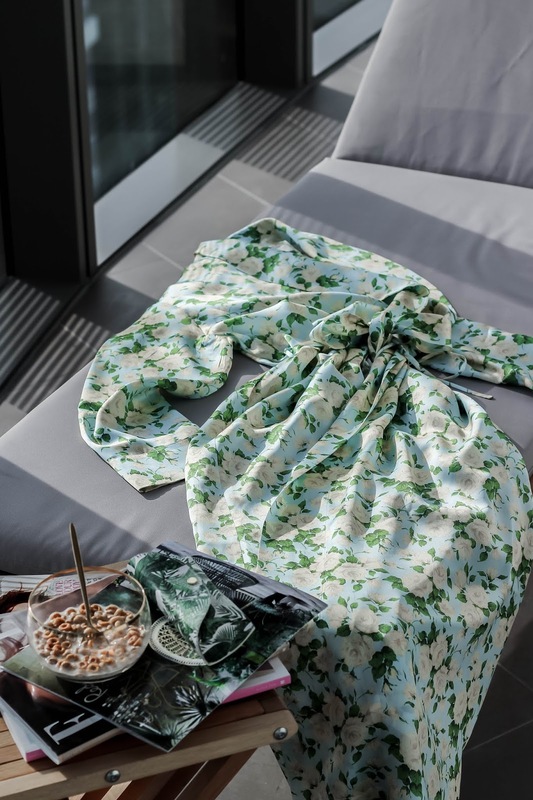 When I spend my mornings at home, I love staying around in my pyjamas for a couple hours as I go about with my routine - but this dressing gown looks so much better than your usual pjs! Always so beautiful, and I also enjoy the morning with a delicious breakfast. I loved this post! Super inspiring, and the photos were so gorgeous! I love wearing silk! I love the cereal bowl, by the way. Soooo pretty! What a beautiful silk gown, so perfect in your warm weather right now. I like the concept of improving the morning routine, pretty nice content Gabrielle. Have a fun weekend! Really cool I love this post! I already follow bloglovin, waiting for you! :) thanks have a great day! You always look fabulous my dear! I definitely need a new cereal bowl. I need that one in the photo!!! Your silk gown is stunning as the pics. I want a morning just like that with that style of yours. Always lovely my dear. 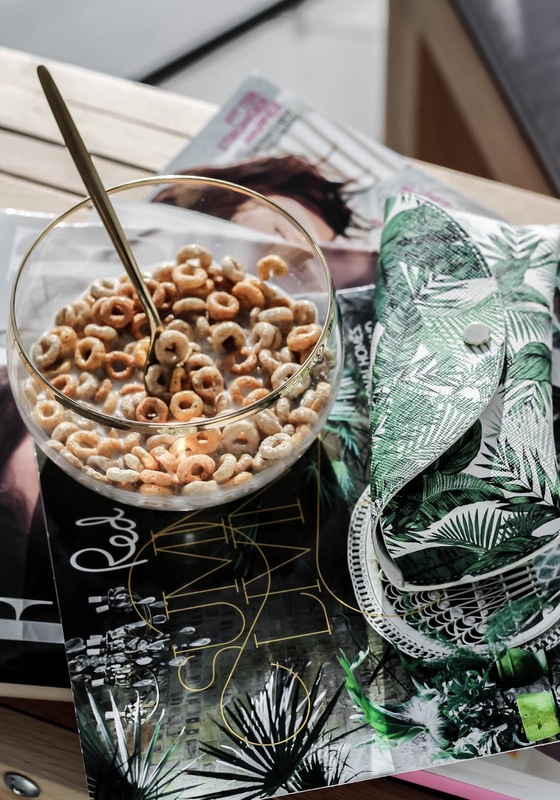 Beautiful pictures and great tips, that's the most glamorous cereal bowl I've ever seen - love it!! 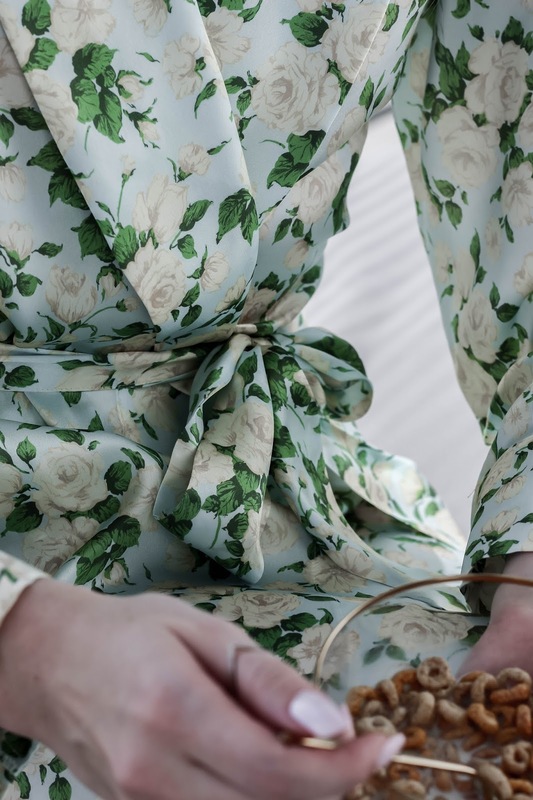 The dressing gown is such a pretty style and print. When the weather changes, I usually tend to mix things up for skincare routine. Sometimes, we’ll also eat outside for breakfast in the courtyard. It makes a difference. You look stunning! Also, I think I'm getting old because I can't help but to focus on your bowl. I love the gold lining!It makes the bowl look simple and elegant. 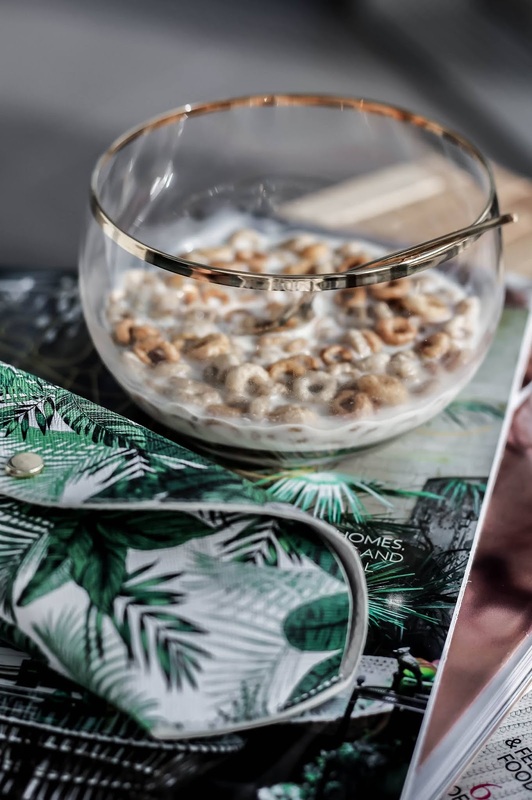 Love the photography in this post and how chic is that bowl! Ok my mornings would go up 1849038042 knotches if I just had that robe and that fancy cereal bowl!! You must feel like a princess eating your cereal out of it lol. I just love it. Firstly the robe you're wearing is utterly gorgeous, the colour and design is beautiful and suits you very beautifully Gabrielle. 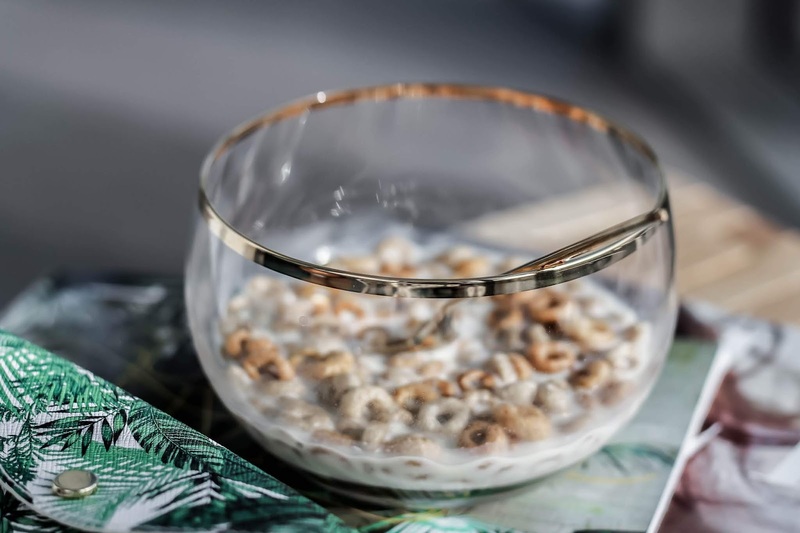 For breakfast I also do the same thing for cereal, the other day I enjoyed my Wheetabix Protein from a Pip Studio mug, colourful bright and lovely and added some sunshine in the morning, I absolutely love cereal and also have it after I workout. A stunning post lovely lady! my mornings consist mostly of waking up 30 mins before I go to work so I usually rush everyday HAHA thanks for sharing this! I will always love morning if that silk i will wear every day. I actually picked up a gold-rimmed cup from Pottery Barn of all places not that long ago and it's a total game changer, it actually made me giddy to get up and make my smoothies and use that cup in the morning! Morning routines are literally my key to having a better day. I'm such a typical gemini that if the morning doesn't live up to my expectations, I feel down through the day. Your tips seem useful and that robe is too cute for me to handle (insert heart eyed emoji). Loved the post!